Clean interface - dirty sounds. Inear Display's Cruelle has a clean interface that's in stark contrast to the sounds that it's said to be capable of producing, which are anything but. 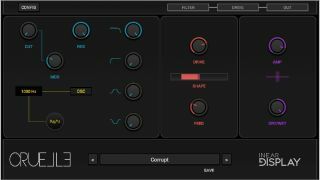 This "brutal" distortion plugin combines an analogue-style filter with audio rate modulation and an aggressive digital distortion module that offers adjustable shape and feedback. It's designed to turn sounds into screaming feedback tones and glitch artifacts. Cruelle promises a fast and furious way of roughening up your sounds and is available now for PC and Mac in VST/AU formats. You can buy it for the introductory price of €9 - the regular price will be €19. Find out more on the Inear Display website.